Despite the astonishingly low price, the Conquer™ packs some serious entertainment power, thanks to a 1Ghz High Speed Processor chugging away happily. It and all that Android 2.3 power work hand in hand to shut down background applications and extend battery life. This way, you can watch movies on its 3.5" HVGA touchscreen display for far longer than ever before on an Android. Or if you want to use that beautiful touchscreen to view photos you've taken or to video conference, it has a 3.2 MP camera and a 1.3MP front-facing camera to make sure your every wish is just a couple of taps away from being granted. Be on the forefront of Android excellence. 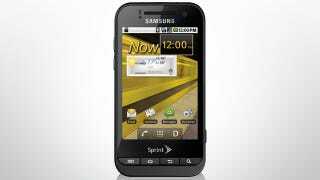 Click here to order your very own Sprint Samsung Conquer™ 4G from RadioShack! * With new or upgrade 2-year agreement on a select plan with $10/mo. Premium Data add-on. $449.99 unactivated.